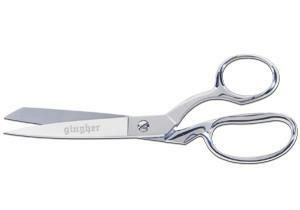 8" knife edge/serrated edge dressmaker's shears, chrome over nickel plated, packaged in hang bag. This item is identical to model G-8 except for the additional feature of having one edge ground with a micro-erration for assisting in gripping filmy fabrics such as silk and rayon. The knife edge offers smooth and easy cutting through thick layers of fabric and can be sharpened using the sharpening stone. Handles on this model are bent at the correct angle for easy cutting on a tabletop or other flat surface.